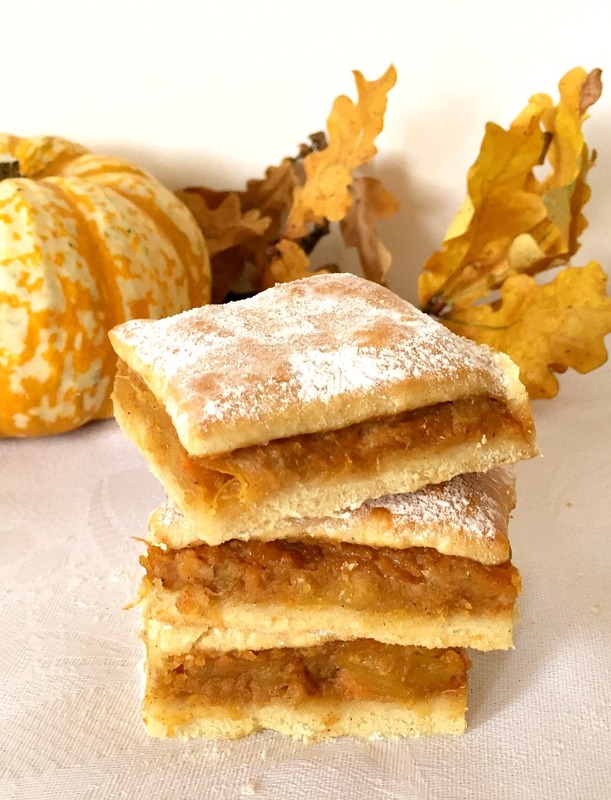 Romanian Sweet Potato & Pumpkin Bars, Fall’s finest and most beloved dessert. 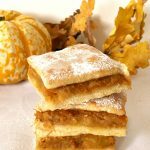 Melt-in-your-mouth homemade pastry, delicious pumpkin and sweet potato filing with a vanilla touch, this is one recipe you gotta try! It’s pumpkin season, whoo-hoo! Grab one nice pumpkin before it ends up being carved for Halloween, they are not around for too long, unfortunately. In the UK, at least, you can only find pumpkins in supermarkets in October, Halloween over, and they are all gone. Shame tough, there are so many yummy recipes you can make. And, unlike in the USA, you won’t find canned pumpkin anywhere. I know, how bad is that! I do try to make the most of it once l find some nice pumpkins, not all are sweet and best for cooking. Otherwise, l guess the next best thing are sweet potatoes, which can be easily found all year around and they taste pretty similar, don’t you think so? My version of pumpkin bars are a bit different from what people might picture when they want something sweet. Let’s say these are the Romanian-style pumpkin squares. Oh, but they are so delicious. If you live in the countryside, happy you! Lots of pumpkins everywhere, and most people will bake these pretty yummy little things. And, if you like cinnamon too, then you hit the jackpot, this recipe is just fabulous. You can use canned pumpkin if you have, otherwise you can bake one like l did. I am telling you right now, kids will just love these squares, and I guess it is a great way of having them to eat veggies, since they have loads of pumpkin and sweet potatoes. Well, ok, let’ s just ignore the sugar 🙂 But anyway, it still counts, right? I mean, my naughty toddler would never touch sweet potatoes, so, the fact that she eats these squares makes me happy that at least she had some veggies. You can completely use either only pumpkin, or only sweet potatoes, the taste should slightly be different, but not massively. The great think about sweet potatoes is that they are around all year long, so you have no excuse not to bake these little beauties no matter the season. Oh, and be generous with the cinnamon, it makes the squres taste so good. I just love cinnamon, you can tell I suppose. Anything cinnamon, and I am happy. Because anything tastes better with it. breakfast sorted! So, anyway, grab a few of these pumpkin bars, switch the TV on, and relax. 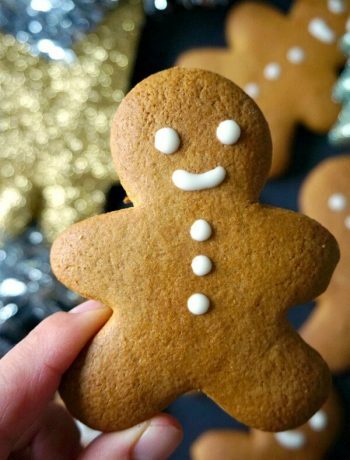 You have done a brilliant job baking them! If you’ve tried these ROMANIAN SWEET POTATO & PUMPKIN BARS or any other recipe on the blog then don’t forget to rate the recipe and let me know how you got on in the comments below, I love hearing from you! You can also FOLLOW ME on FACEBOOK, and PINTEREST to see more delicious food and what I’m getting up to. 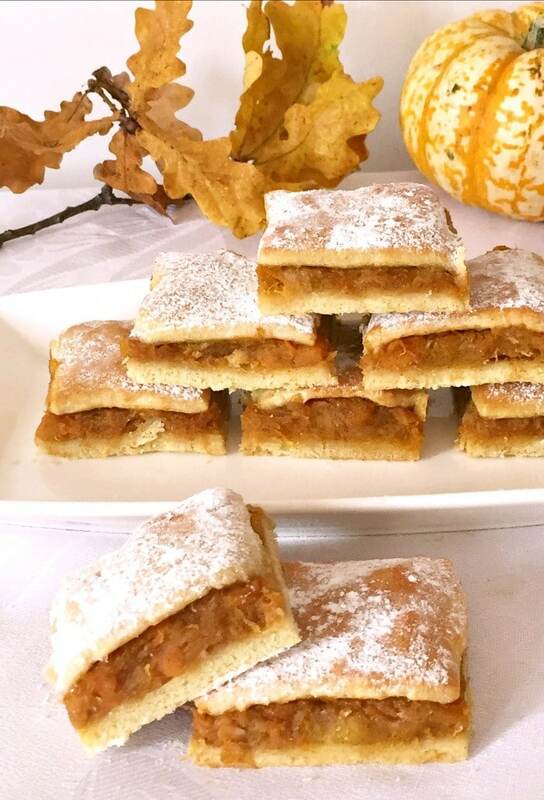 Romanian Sweet Potato & Pumpkin Bars, Fall's finest dessert. 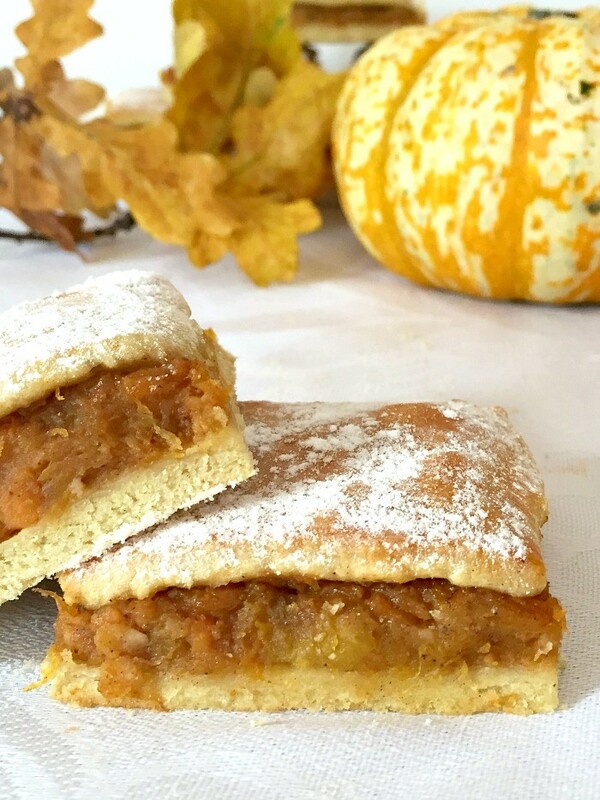 Melt-in your-mouth homemade pastry, a delicious pumpkin and sweet potato filling with a vanilla touch, you gotta try this recipe! A nice dessert for Thanksgiving. For the filling, cut the pumpkin in half, scoop out the seeds, then arrange it on a roasting tray together with the sweet potatoes in their skin. Bake at 200 degrees Celsius (400 degrees Fahrenheit) until soft. Peel the sweet potatoes and scoop out the flesh from the pumpkin, add them to a bowl, then use a fork to mash them well. Mix in the sugar, cinnamon and vanilla extract and allow to cool completely. 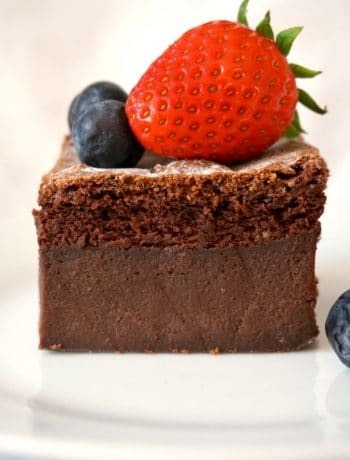 To make the crust, add the milk, sugar and oil to a pan and bring it to a boil. Once it has cooled down, beat one egg in and add the vanilla extract too. In a large bowl, mix the flour, bicarbonate of soda and salt, then make a well in the middle and add the wet ingredients. Use your hands to work the dough until soft and no longer sticky. Shape it into 2 balls, then roll the first one so that it can cover the bottom of a baking pan that had been oiled and floured ( I used a large rectangle baking tray). Sprinkle one teaspoon of semolina over the bottom dough sheet, then spread the filling evenly, sprinkle one more teaspoon of semolina over it, and top it with the second dough sheet. Semolina is perfect if you want to avoid soggy bottoms when you bake a crust. Beat the egg and brush it over the pie. 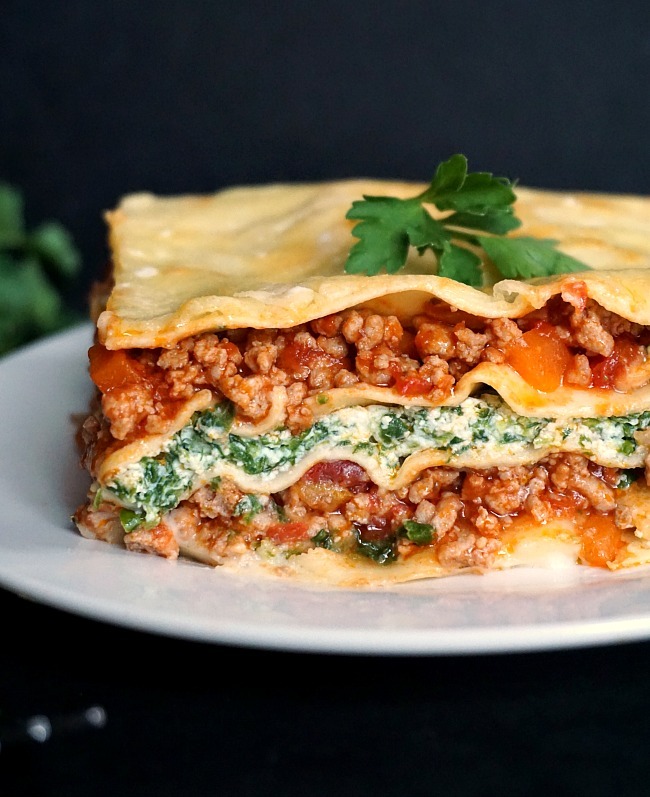 Bake in the preheated oven at 180 degrees Celsius (375 degrees Fahrenheit) until golden, depending on your oven it might take about 20-30 minutes, but do check the oven regularly. Allow it to cool and sprinkle powdered sugar over it. I love the combination of pumpkin and sweet potato – a unique twist on a fall dessert. I definitely need to try these out! Thank you, glad you like them, they are my favourite pies. Nice with a cup of tea! Indeed! Nothing like a nice dessert and some tea!